This is a brief selection from the Urdu verses of Ghalib. 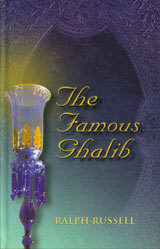 The title is taken from a verse of his in which he boasts "I am the famous Ghalib; you need ask no more." It is intended as an easy introduction to his poetry, giving only those verses which require no explanation. The verses are given in Urdu, Hindi and Roman script, along with the English translation. There is an essay on "Getting to Know Ghalib" and another on the problems of translating his verse into English.